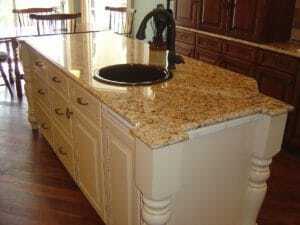 The countertop material of your kitchen could be beautiful and perfect. However, that is very difficult without the correct fabrication. This is our aim: To Design and fabricate with special attention to each detail in order to provide our best. Fabrication is the sequence of events which brings natural stone from the quarry to the home has not changed much since stone entered the homes of the ancient Greeks. 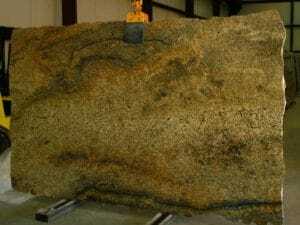 Large blocks of stone are cut from the quarry. From those blocks, thin pieces of stone are cut called slabs. The slabs are then shaped and polished and shipped for installation. Saws perform several functions during fabrication. A block saw, or gang saw, cuts the massive stone blocks into slabs. These days, diamond wire saws make short work of this task. A metal wire is studded with industrial-grade or synthetic diamonds, and this wire quickly cuts through stone as hard as granite. A bridge saw is then used to cut the stone slab into the proper shape for its application, whether it be a countertop or a sink. These saws typically use circular metal blades studded with diamonds, and water is sprayed onto the blade to cool it during the cutting process. Modern technology has produced a new type of saw utilizing water jets combined with an abrasive material, which cuts edges and holes quickly and smoothly, and many fabricators are upgrading to these machines. Polishers grind down the naturally rough surface of the stone to whatever finish the consumer desires. Hard stones like marble and granite can be polished all the way to a mirror finish. The polisher consists of rotating pads which are surfaced with an abrasive substance. The finer and smaller the abrasive grits are, the higher the polish. Most modern polishers can produce a variety of finishes, from the smooth, soft look of a honed finish to a slick, shiny mirror finish?even decorative finishes like flamed, tumbled, or hammered. Routers create edge profiles on a slab, and cut designs on larger pieces like fireplace mantles and hearths.There are dozens of standard edges for countertops and tables, from simple to highly decorative. Routers have a spinning blade covered with diamonds which is water-cooled. It travels along the edge of the slab to shape it.